From the end of April to June you may come across a strange ball-shaped object on a bush or a fence. If there is the smallest disturbance, the object disintegrates coming apart in all directions. It is then you realise that the object was a congregation of Garden Spider or Cross Spider (Araneus diadematus) spiderlings. 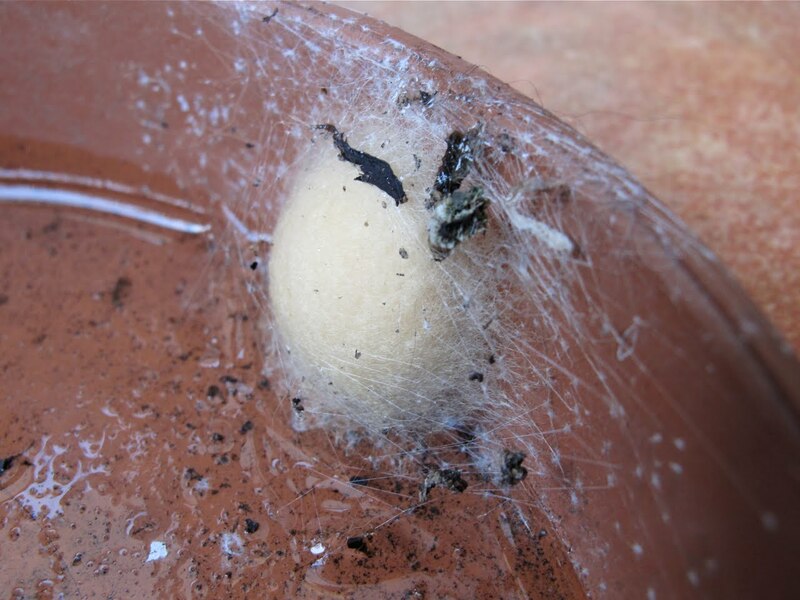 Garden spiders lay several hundred eggs and wrap them together in a silky cocoon in the autumn. Hatchlings moult once when still inside their silky cocoon and, after a week they follow each other out of it. 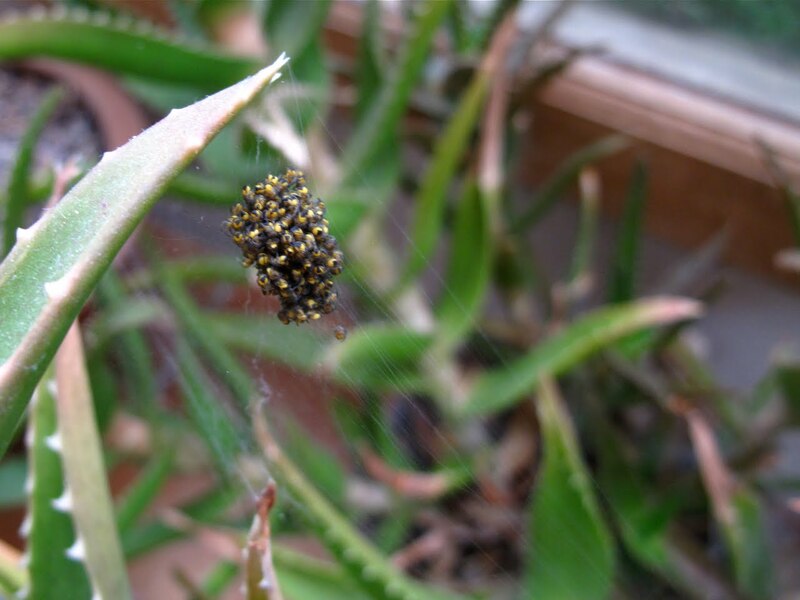 Spiderlings have a strong aggregation instinct, they still have large abdominal yolk reserves and do not eat for a few days. Instead, they make a communal web by weaving threads upwards of the cocoon and hug each other in a tight ball in the middle of the web until all their yolk is reabsorbed. With time they become more aggressive to each other and they start their independent, solitary lives. Why do they get together like this? does this behaviour give them some advantage early in their lives? Experiments revealed that spiderlings can survive and make normal webs when reared in isolation. Although communality does not seem necessary for survival, communally reared spiderlings survival rates were higher than spiderlings reared in isolation. 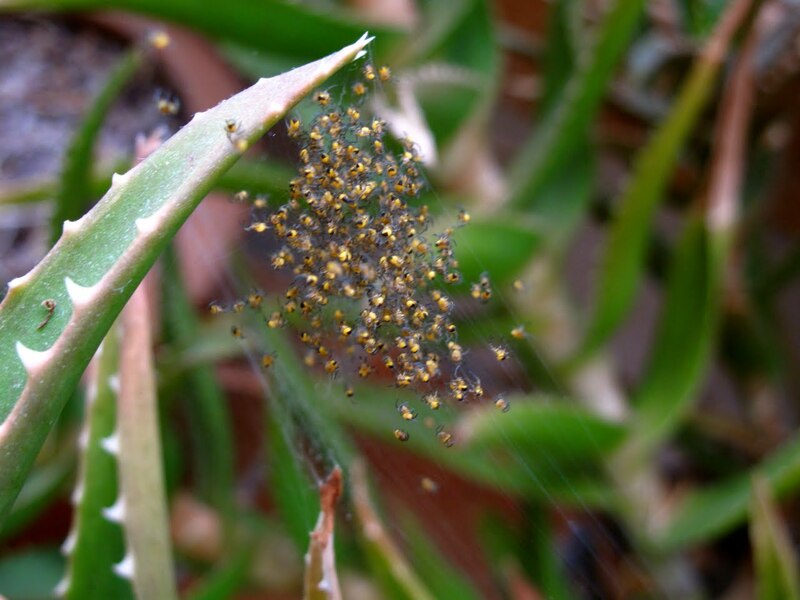 High air humidities made spiderlings came closer together in their communal webs: this could be an adaptation to avoid becaming trapped in water dropplets in the rain when isolated which can easily result in drowning for such small animals. The communal behaviour could also offer protection against predators: all spiderlings sitting in the middle of a radial web is a very good sensory device that could provide them an early warning system for approaching predators, especially when coupled with their surprising explosive dispersal reaction to minimum disturbance. When the air was dry and the yolk has been absorbed, spiderlings came apart from each other, and it is in such dry conditions that spiderlings make a long silk thread that allows them to balloon in the air and disperse from their natal place. The spiderlings felt a little gust of air -from my breathing near them when taking the photo above - and rapidly came apart. Burch, T . L . 1979. 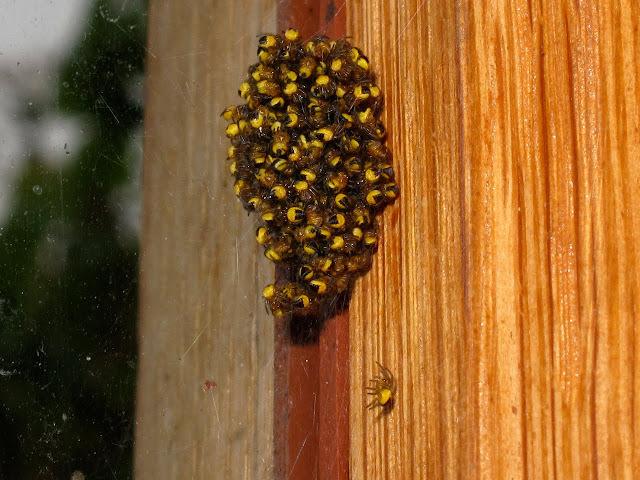 The importance of communal experience to survival for spiderlings of Araneus diadematus (Araneae : Araneidae). J . Arachnol . 7 :1-18 . here. Oh, now that is just way too cool! Great pics - great info. I've never seen a spider ball (yet), but I shall now keep my eyes peeled for them! Your first picture is wonderful. I live in hope that I'll run across a spider-ball out there somewhere. Thank you Ellen, Antje and Joy for your comments. Joy, I hope you see one soon, I think there is still hope this year!